Crocheting Mandala cloths has been such a fun adventure. I love how you can mix and match colors to create beautiful patterns. Here is a roundup of all the different Mandalas I crocheted this week. 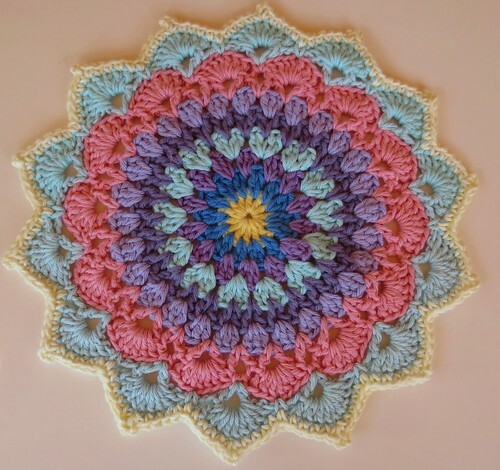 This pastel Mandala cloth was crocheted using the Magnolia Mandala pattern. I crocheted this cloth using sugar’n cream cotton scraps. My finished cloth is 11.5 inches wide. It is such a pretty cloth and would make a beautiful hotpad or just as a decorative centerpiece on a table. Next I crocheted several more Mandalas using Lucienne’s Summer Mandala pattern. My dishcloths were all just crocheted to part 1 of the original pattern which has up to 4 parts for a very large Mandala.